Most people only experience a handful of “Where were you?” moments in their lifetimes, but you can remember them vividly, like they were yesterday. One such moment happened for hockey fans in the summer of 1988. It was Aug. 9. I had just turned six a few days earlier and I was in Brampton, Ont. My family had returned from an ill-fated RV trip to Algonquin Park and Quebec City. My most vivid memory of that voyage was the RV’s septic tank backing up and spewing waste all over the tiny bathroom. I found it funny. Nobody else did. As I waited at my aunt and uncle’s for my father to return from bringing back the RV, my mother came into the room to let me know that Wayne Gretzky had been traded. I didn’t really understand. Wayne Gretzky was the Edmonton Oilers. How was that even possible? You can’t trade him. It must be a mistake. Grant Fuhr was on The Rock when he heard about it and he, too, didn’t understand. “The Trade” was real. On the afternoon of Aug. 9, 1988, Wayne Gretzky, Marty McSorley and Mike Krushelnyski were traded to the Los Angeles Kings for Jimmy Carson, Martin Gelinas, first-round draft picks in 1989, 1991 and 1993, as well as $15 million in cash. Canada’s most iconic sports figure – perhaps ever – would now ply his trade in the United States. Fresh off of a fourth Stanley Cup triumph in five seasons, Gretzky was headed for the west coast. The move that sent shockwaves across the country didn’t happen overnight. The mastermind – Kings owner Bruce McNall – had been engineering the move for months. McNall’s pursuit of Gretzky wasn’t made with just a Stanley Cup in mind. It was made to save the Kings. Bruce McNall bought full control of the Kings earlier in 1988. 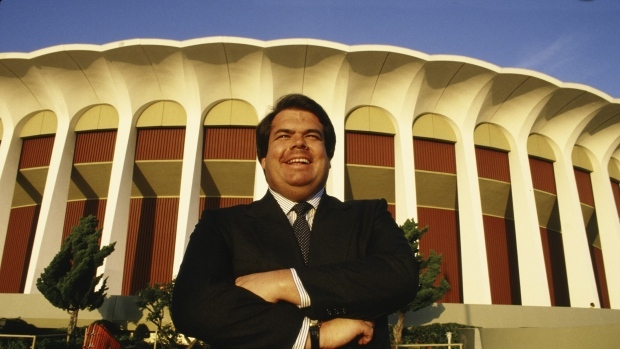 A coin collector and movie producer, the charismatic McNall came on board with Kings ownership in 1986, when he bought a 25 per cent stake from Lakers owner Jerry Buss. By 1988, McNall owned the team outright. A native of nearby Arcadia, CA, McNall knew that the Kings would always play second fiddle to their Great Western Forum arena-mates, the Lakers. That was fine, but the team was on the verge of becoming a complete nonentity in the market with its viability coming into question. The Kings were trending upward led by that trio, but success had been hard to come by in a division with the juggernaut Oilers and the powerful Calgary Flames. After a 68-point season, the team fell in five games to the Flames in the Smythe Division semi-finals. The Kings had not won a playoff round since 1982. But for the diehards, there was reason for excitement. Carson, 19, had just scored 55 goals as a sophomore. Robitaille, 21, had 111 points. Jimmy Carson would spend only a single season with the Oilers. Carson was excited about the team’s future. McNall first floated the Gretzky idea to Buss back in 1987, knowing that it would seem preposterous. You can’t just go get the sport’s best player. It doesn’t work like that. These things don’t happen. Beginning with the general managers’ meetings in December of 1987, McNall began a campaign to make his pipe dream into reality. This became a singular pursuit for McNall with no fallback in place. “There was never any other plan,” McNall said. “There was no other plan because, frankly, there’s no person - and that includes today, by the way - that sells hockey tickets…I mean, how many people actually buy tickets to see ? When Pocklington finally got serious, the price was expectedly exorbitant, McNall recalls. As McNall and Pocklington opened negotiations, one thing became crystal clear: Oilers general manager Glen Sather could not be involved. As negotiations began in earnest, the Oilers made it very clear that they coveted Robitaille. With 45 goals in his rookie campaign, the Montreal native looked to be blossoming into an elite winger. “They wanted Robitaille and I said, ‘No way, you can’t get Robitaille’ because I was still worried about some of the big arguments [to come over negotiations,]” McNall said. The Oilers moved on to Carson. About two weeks prior to the trade, Carson received a phone call. Though originally loathe including the Southfield, Mich., native, McNall came around to idea of building his package around Carson. The last obstacle to overcome for McNall was Gretzky himself. In July of 1988, Gretzky married actress Janet Jones at Edmonton’s St. Joseph’s Basilica. It was the closest thing to a Canadian royal wedding, as it was broadcast live across the country. With his personal life undergoing big changes, McNall didn’t want to upset his professional life, as well. Pocklington’s refusal wasn’t going to stop McNall. Though skeptical at first, Gretzky came around to the idea in large part due to a phone call from Pocklington – one that Gretzky wasn’t supposed to be a part of. With Gretzky fully on board, McNall went about finalizing the deal. Though he had forgotten about the trade weeks earlier, Carson’s memory was jarred in a hurry. It was all for naught. The deal was done. While the trade was ostensibly about Gretzky, Carson was swallowed up in the hype all the same. Even McNall and the Kings weren’t ready for the maelstrom it precipitated. 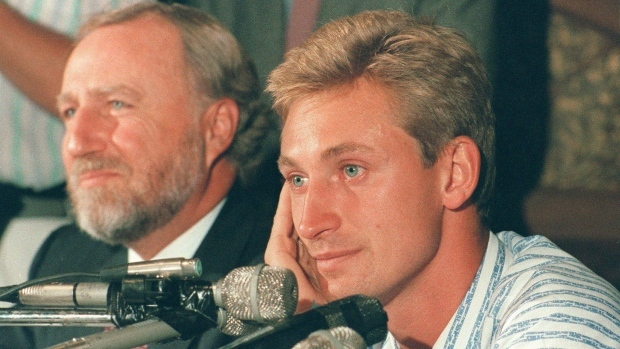 For his part, Krushelnyski felt fortunate to be part of Gretzky’s plan. Dividends began to pay off immediately for the Kings. Attendance skyrocketed from an average of 11,667 a night in 1987-1988 to 14,875 in 1988-1989. It was a circus everywhere the Kings went. In Alberta, there was a different kind of upheaval. For Carson, acclimatizing himself to his new surroundings would prove to be a challenge. How do you go about replacing Wayne Gretzky? Despite moving the franchise cornerstone and a key member of a tight locker room that grew up as pros together, Fuhr says the Oilers players didn’t hold any animosity over the trade. But for fans at the Northlands Coliseum, seeing an Oilers team without a No. 99 on the ice for the first time in a decade was a hard proposition to swallow. While Carson was struggling with change, there was no such problem for Krushelnyski. On the ice that season, the Oilers took the step back that was expected, finishing third in the division. The Oilers’ 84 points were the fewest the team registered since the 1980-81 season, their second campaign in the NHL. Carson, though, starred in his new surroundings, notching 49 goals and 51 assists. Still, he knew that wasn’t going to be good enough. 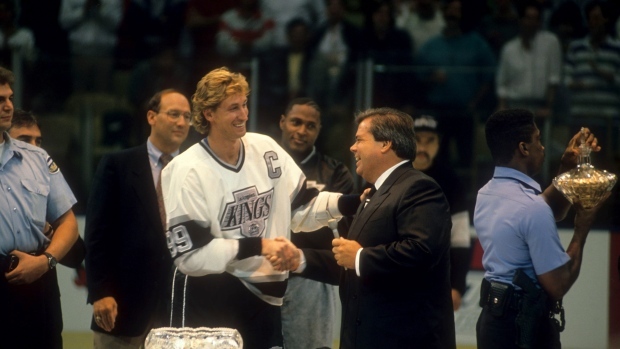 Gretzky and the Kings thrived in L.A. The Great One scored 54 goals and added 114 assists en route to his ninth Hart Trophy. The Kings’ 91 points was the club’s best total in eight seasons and the team finished second behind the Flames for their best finish in the Smythe since realignment in 1981. Naturally, the Oilers and Kings were fated to meet in the first round of the Campbell Conference playoffs. Both teams were desperate to make a statement. The feeling was mutual in the Edmonton locker room. After splitting the first two games, the Oilers – in defence of their Stanley Cup – opened up a commanding 3-1 lead in the series with Carson scoring in Games 3 and 4. But the Kings would fight back, taking Games 5 and 6 to force a deciding Game 7 at the Forum. It was there that Gretzky showed the local faithful why McNall tried to move mountains to acquire him. 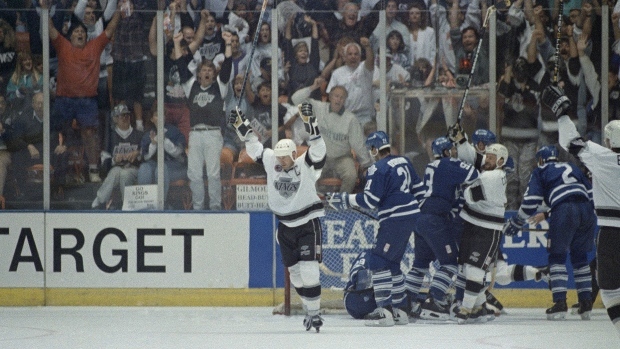 The Kings won the game 6-3 with Gretzky opening the scoring less than a minute into the game and then icing it with an empty-netter. The series might not have been a referendum on the trade, but it certainly felt like one. The Kings would go on to be swept out of the playoffs in the Smythe Division final by the eventual Stanley Cup champion Flames. Though the Oilers would go on to win the Stanley Cup in 1990, Carson wouldn’t be part of that team. Only four games into the 1989-1990 season, Carson was moved in a six-player trade to the Detroit Red Wings that saw Adam Graves, Petr Klima and Joe Murphy head to Alberta. 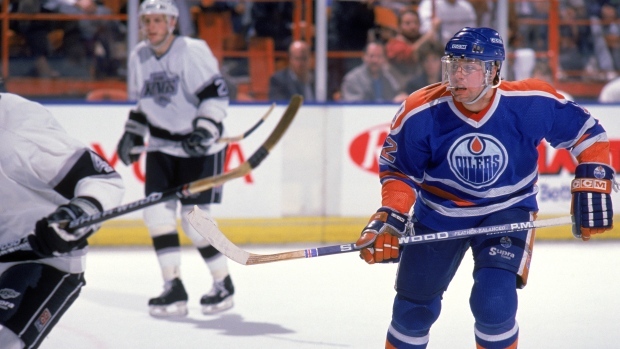 The Oilers’ centerpiece of the Gretzky trade was gone after little over a single season. Was there a certain sense of relief in leaving Edmonton for Carson? In California, McNall got what we wanted from the Gretzky trade, but never a Stanley Cup. But McNall believes that’s okay. The closest he would come was in 1993 when the team reached the Cup Final. In loading up for that year’s playoff run, the Kings brought back Carson before the trade deadline, allowing the two men who would forever be associated with The Trade to play alongside one another. That run would effectively be the end of McNall’s tenure with the Kings. In December of 1993, he defaulted on a $90 million loan from the Bank of America and was forced to sell the team by the following spring. In 1997, McNall was sentenced to five years in prison for bank fraud. He was released in 2001. Three decades after the fact, Carson remains inextricably linked to The Trade, something he’s at peace with. Carson has now found a successful career in finance not far from Detroit after leaving hockey at the age of 30. Now Carson sees himself as more of a finance guy who used to play hockey than an NHLer working in finance. For McNall, having The Trade as the biggest mark he made in sports is gratifying. Thirty years later, you can still ask hockey fans of a certain vintage about The Trade. You don’t have to specify. People will know the one you’re talking about. And they’ll remember exactly what they were doing on a lazy summer afternoon in 1988. An earlier version of this piece ran as part of TSN.ca's Canada 150 coverage.